Starring: Mila Kunis, Kristen Bell, Kathryn Hahn, Christine Baranski, Susan Sarandon, Cheryl Hines, and more. Due to popular demand… Well, personal demand rather. I took the time out of my day to catch ‘A Bad Moms Christmas’ to follow up my review of the first installment, ‘Bad Moms’. My review of ‘Bad Moms’ garnered a good bit of views as well as a large amount of hate from a particular demographic. Who, you wonder? You will never knooooooow. Anywho… I have to follow up the success of the first review by possibly suffering through this sequel and so here we are now! My review of ‘A Bad Moms Christmas’! So there is no hiding it and it is pretty apparent from my intro to the actual review that I was not the biggest fan of ‘Bad Moms’. While ‘A Bad Moms Christmas’ plays off that same demographic that made the first installment a “success”, it actually does things a bit different this time around. Okay, yes, I will address the elephant in the room that my last sentence may have sparked; I did enjoy ‘A Bad Moms Christmas’. The film, this time, does not try to do too much like the first film did. It had a central focus (Christmas… duh) and it stuck to it for the duration of the film. With this focus, the film takes constant cracks at what spreads Christmas joy and what spoils it. What is necessary and what is just a tad unnecessary. While all this occurs, we see everyone’s favorite bad moms crack their raunchiest jokes and cause the craziest of Christmas moments. Impressively enough, I was shocked to see no direction or writing change occurred between the 1st to the 2nd film. I am shocked because as much as I was dissatisfied with the first, there is an incremental increase in my rating for the sequel and an overall funnier experience this time around. While there are still plenty of displeased eye-rolling jokes made, they were heavily outweighed by the numerous belly laughs coming out of myself and my girlfriend. Moral of the story is, if you thought the first film was funny, I would be sure you will think this one is as well. Maybe even more so. And if you were not satisfied by the first, this 2nd may actually redeem itself to you. It did so for me at the very least. While I will not sit here and say that this film is a marvel of comedy, it is at the very least much better than the original. It still has elements that made the first film a failure in my eyes. However they are nowhere near as heavily pounded on as ‘A Bad Moms Christmas’s predecessor was. This film narrows its scope and focuses the funny at Christmas and what these moms do with the holiday, causing outrageous moments within the film and an entertaining mindless experience for the audience. 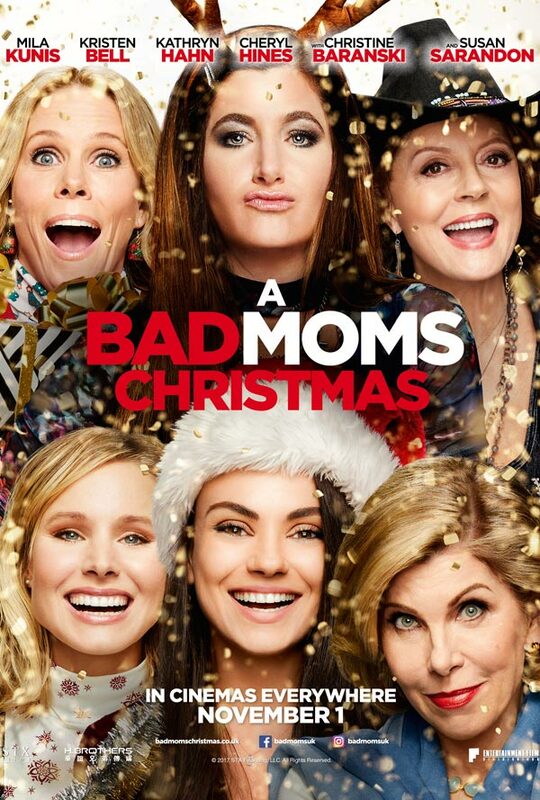 Posted in 2017 Movies, Movie Review.Tagged A Bad Moms Christmas, Bad Moms, Jon Lucas, Kathryn Hahn, Kristen Bell, Mila Kunis, Movie Blogger, Movie Reviews, Movies, Scott Moore.